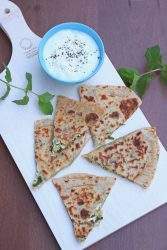 Qutab | Kutab | Azerbaijani Stuffed Flatbread is a popular breakfast recipe and the choices for filling can be unlimited. I made mine with Onion and Cheese filling with some fresh herbs and served it for weekend brunch. Boil about 4 to 5 of water in a pan. In another pan combine the flours and the salt. Slowly add the boiling water and stir with a wooden spoon. Keep adding water until a solid mass forms. At this stage cover the dough for few minutes to cool down enough to handle. Now add the oil and knead the mixture into a soft dough. Sprinkle more warm water if needed. Heat oil in a pan and saute the onions and spring onions until just soft and translucent. Add the salt and crushed red pepper to this mixture and mix well. Let this mixture cool down and then add the grated / crumbled paneer, chopped mint and cilantro and mix well to combine. Dust each ball with enough flour and roll it into very thin circle. Place about 2 TBSP of filling on one half of the rolled dough and cover it with the other half. Seal the edges well and cook it on a hot cast iron or a heavy pan. Apply oil on both sides and cook until golden brown.